Skateboarding on the flats or downhill is great, but uphills are a pain. 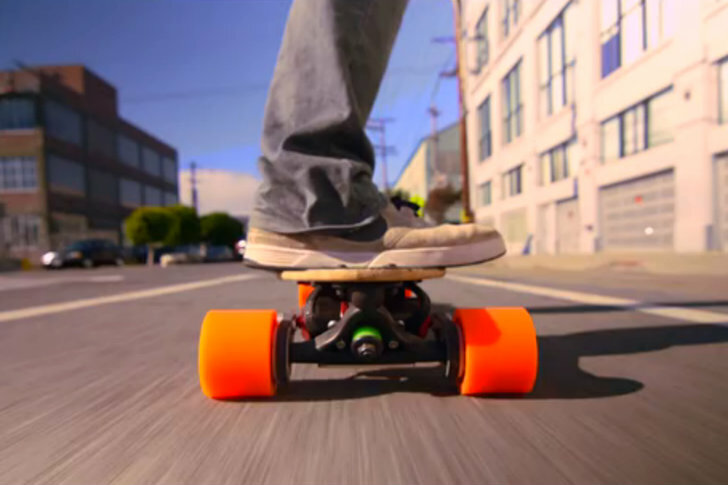 That's all about to change with Boosted Boards, an electric skateboard capable of going up, down and even braking. It's like your traditional longboard, but way better because you've got 6 miles of battery life and can go up to 20 mph. At just 12 pounds, this is the lightest electric vehicle ever made, and it's set to revolutionize your daily commute. Based out of Palo Alto, Boosted Boards was created by a group of outdoor enthusiasts and Stanford alumni who wanted their skateboards to do more, go farther and go faster. A Boosted Board is a souped-up longboard with an electric motor that lets you travel up to 20 mph and even go uphill (up to a 15% grade). A handheld controller lets you set the speed, apply the regenerative breaks and check your battery level. But you can also ride it without the motor, just like your regular longboard and carve down hills (we highly recommend a helmet). The lithium batteries can take you up to six miles before you need to recharge. Or you could push the skateboard to generate some juice for later. At only 12 pounds total, this electric skateboard is the perfect ride to compliment your commute. Use it for errands, an easy cruise to a party, a low-hassle and fun way to get to work, a ride to the station and more. It’s lightweight, doesn’t need a parking space and will cost you less than $5 a year to charge up. Sanjay Dastoor, Matthew Tran and John Ulmen began their project over a year ago building from standard skateboard parts including a Loaded longboard, Bear Grizzly 852s, Otang 80A In Heats, and Jehu bearings. With mentoring from both Apple and Tesla alums, they designed their own proprietary on-board computers, motor controllers, and software from scratch and added the twin brushless motors and batteries. They’ve already built and tested a number of prototypes and are gearing up for full on production with the help of their Kickstarter campaign. Get in on one of the first production models by funding their campaign and help launch the next wave of electric vehicles. Based out of Palo Alto, Boosted Boards was created by a group of outdoor enthusiasts and Stanford Alumni who wanted their skateboards to do more, go further and go faster. A Boosted Board is supped up longboard with an electric motor that lets you travel up to 20 mph and even go uphill (up to a 15% grade). A handheld controller lets you set the speed, apply the regenerative breaks and check your battery level. But you can also ride it without the motor, just like your regular longboard and carve down hills (we highly recommend a helmet). Carry your boards with you on a train, in a car, into work or up to your apartment. The lithium batteries can take you up to 6 miles before you need to recharge. Or you could push the skateboard to generate some juice for later. 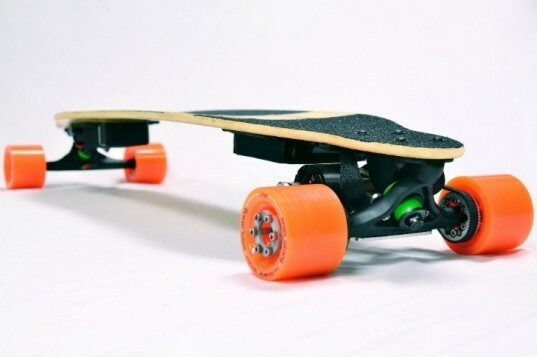 At only 12 lbs total, this electric skateboard is the perfect ride to compliment your commute. Use it for errands, an easy cruise to a party, a low-hassle and fun way to get to work, a ride to the station and more. It's lightweight, doesn't need a parking space and will cost you less than $5 a year to charge up. Sanjay Dastoor, Matthew Tran and John Ulmen began their project over a year ago building from standard skateboard parts including a Loaded longboard, Bear Grizzly 852s, Otang 80A In Heats, and Jehu bearings. With mentoring from both Apple and Tesla alums, they designed their own proprietary on-board computers, motor controllers, and software from scratch and added the twin brushless motors and batteries. Boosted Boards feature 2000 W of power (2.6 hp) with a range of 6 miles, a top speed of 20 mph and a top uphill grade of 15%. hey've already built and tested a number of prototypes and are gearing up for full on production with the help of their Kickstarter campaign. Get in on one of the first production models by funding their campaign and help launch the next wave of electric vehicles.